The other day on G+ I declared jihad on the very concept of "session IPA." Who needs something conspicuously light, and with a nominal ABV percentage, for "session" drinking? Not me, no thank you. 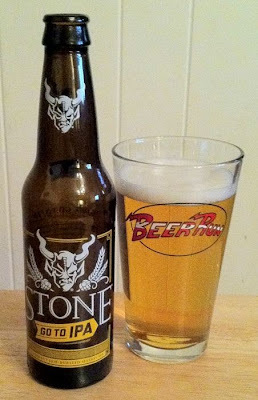 But I am still a devout Stone Brewing fanboy, and I'm happy to try everything they release, even if the particulars don't appeal to me initially. That's how I ended up with a bottle of Stone's Go To IPA, which is intended for session drinking. Go To is very bright, clear, and yellow, with a ton of carbonation and a little bit of suds. The aroma has lemon zest notes, a little bit of pine. The flavor hits up front with a lot of hop character, grapefruit and pine notes, and initially it isn’t bad. But that fades very quickly to a bright but watery and insubstantial finish. It is hard for me to settle for less from the brewery that makes Enjoy By and Ruination. I don't much like Levitation, their lighter IPA, and I like this even less. The jihad stands.